If you are looking for a quiet (ish) place to take a few minutes to relax (maybe with a treat from the Confectionary), check out the side street between Uptown Jewelers and the Glass Blowing Shop (about halfway up Main Street on the right if you are facing the castle. It is amazing how the noise and bustle of Main Street fades into the background and there are some nice tables where you can sit for a few minutes and relax. While you are there look & listen. Look up at the windows to note some of the important people who helped create the Magic Kingdom, and listen as you will hear some music and singing lessons taking place overhead from the windows. Just another great detail that makes Walt Disney World so much more than a theme park. You can’t miss the Trolley Show on Main Street USA. The singing and dancing and colorful outfits (all of which are usually themed to the season) just make you smile! It is like you are part of a musical like Meet Me in St. Louis. 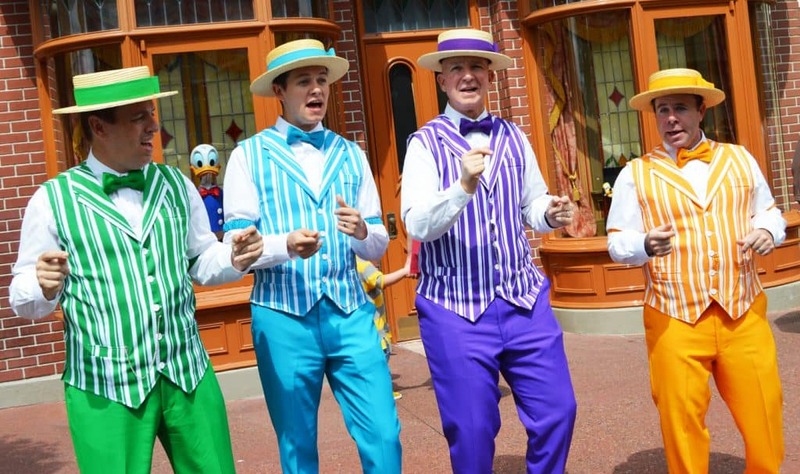 The other can’t miss entertainment is the Barbershop Quartet, the Dapper Dans. They are so fun and entertaining, and their takes on various songs (Classics, Disney, Patriotic, Seasonal) are really well done and very enjoyable for everyone. I try to seek them out every trip. Here’s a tip—pick up a times guide as you enter the park so you can find out when and where both of these shows will be happening that day. Yes, you can meet some of your favorite Disney Characters on Main Street (like Tinker Bell and Mickey Mouse in the Town Square Theater), but I’m talking about characters who may have inhabited Main Street at the turn of the 20th century: the Mayor, the Reporter, the Suffragette, and the Fire Chief. During the day as you stroll (or walk briskly) down Main Street on your way to the lands of the park and your fun attractions you may see these characters walking along the street. I highly recommend that you stop and chat with them for a while—they are so entertaining! Going along with the theme of Casey’s Corner (a baseball themed hotdog shop), and the theme of Main Street USA, you will find some amazing talent playing the piano just outside the restaurant. 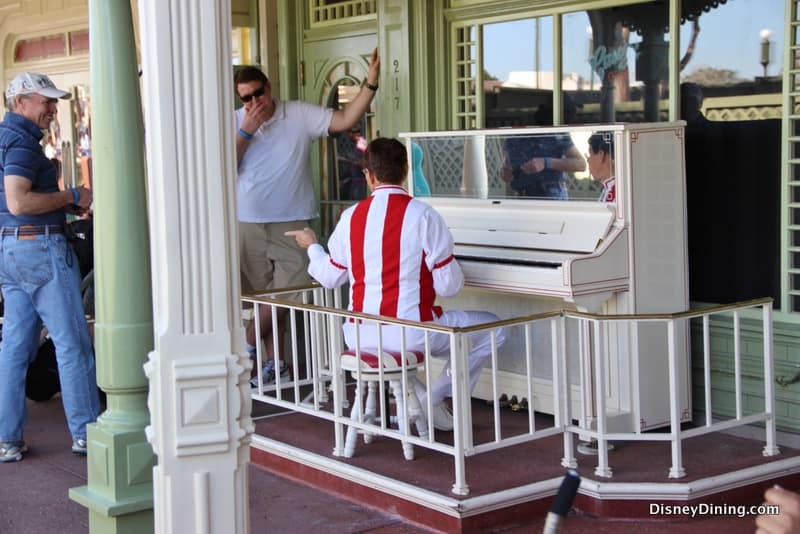 You can enjoy it as you walk by on your way to Adventureland or Liberty Square, but if you are eating at Casey’s and have your hotdogs outside you will be entertained by the ragtime music played on the piano. Even beloved Disney songs take on a ragtime rhythm here. Yes, there are other stations around Walt Disney World where you can catch a ride on the Magic Kingdom Railroad, but the Main Street USA station just feels like the best one to me. The station itself is worth a visit (even when the train is down for refurbishment) just for the beautiful views it offers of Main Street USA and Cinderella Castle. 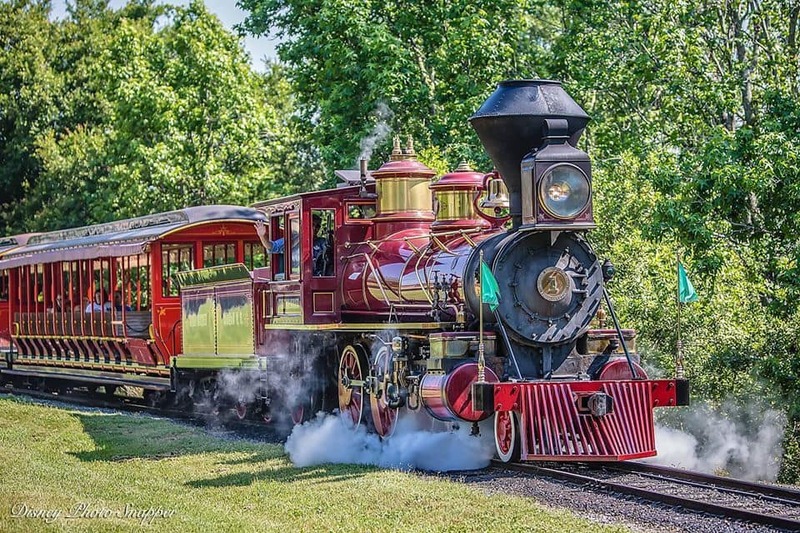 On the ground level you will find railroad memorabilia that is pretty interesting, and tells of Walt Disney’s connection to model railroading along with Disney Legend Roger Broggie. On the second level along with the great views are some fun props you would find in an early 20th Century Train Depot. 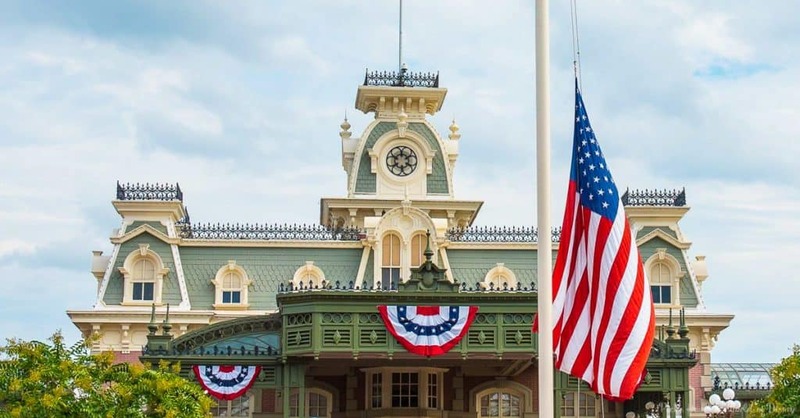 Plus, the iconic whistle of the train as it pulls into the station and that unmistakable chugging are all part of the character of Main Street USA. Main Street USA is the part of the Magic Kingdom Park to pay homage to its founders. In the hub near the Castle you will find the beloved “Partners” Statue sculpted by Blaine Gibson in 1993. Here Walt & Mickey hold hands as the survey they creation of the Magic Kingdom and all of the imagination and fantasy that goes along with it. This is a popular photo location with Cinderella Castle in the background. As in life, Walt took the spotlight while his brother Roy took the backseat, with Roy’s statue taking a more conservative stance seated on a bench with Minnie. Roy’s statue, “Sharing The Magic,” is normally located in Town Square and features Roy and Minnie Mouse seated on a bench. This is another great photo opportunity, but sometimes the statue is moved for seasonal decorations. “Sharing the Magic” was also sculpted by Gibson in 1995. These special tributes help us remember who we have to thank for all of the magic around us. The Hub Grass, which isn’t actual grass but turf, is a relatively new addition to the Magic Kingdom but an immediately popular one. 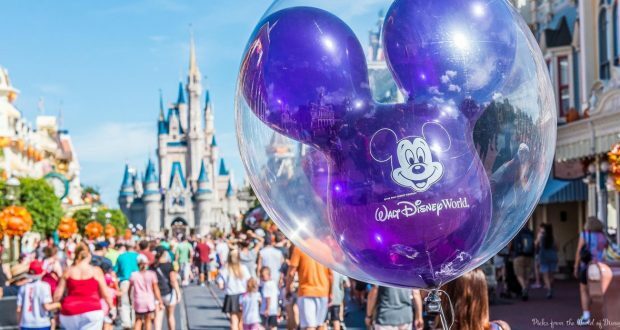 Located in the park-like areas as you get closer to Cinderella Castle, the “hub grass” (because it is around the hub) is a great place to relax with a picnic lunch or snack, let kids run off some steam, or just enjoy the views around you and do some people watching. These areas can be roped off in the evenings in preparation for Fireworks Dessert parties that use them for reserved viewing. The Flag Retreat in Town Square is one of the most touching ceremonies at Walt Disney World. Before dusk each day the band along with a Color Guard say the Pledge of Allegiance and play the Star Spangled Banner. A Veteran is chosen each day to participate as a thank you for their service to our country and they are presented with the folded flag. Guests can participate by watching and reciting the pledge along with joining in singing God Bless America. Check the times guide for an exact time on the day of your visit, you will want to make an effort to see this ceremony. While it may be debatable that the nightly fireworks show, Happily Ever After, is a Main Street USA attraction, I argue that it must be because standing on Main Street, especially just behind the hub, is the only place where you can fully appreciate the show with its projections, lasers and fireworks. Happily Ever After is an amazing display of beautiful visuals punctuated with fireworks, all set to the soundtrack of our favorite Disney movie music. It is the perfect ending to a magical day in the Magic Kingdom, which means you both begin your day with an awe-filled stroll up Main Street USA, and end it the same way. What are your favorite things on Main Street USA?